During the December Moonshot Community Action Network (MCAN) meeting, five local Champions – Dr. Fran Adams, Judi Miller, Ray Oglethorpe, Barry Tatem, and Chief Keith Touchberry – were honored for their efforts to ensure 90 percent of Indian River County students are reading on grade level by the third grade. Each year The Campaign for Grade-Level Reading [a nationwide collaborative created to ensure that more children in low-income families succeed in school] honors individuals who support early literacy. In 2018, 47 communities identified Champions - volunteers, educators, school and civic leaders and public officials - nominated for their support. Each of these champions of literacy brings something different to the Moonshot Moment movement and The Learning Alliance's goal to create an ecosystem for early learning. 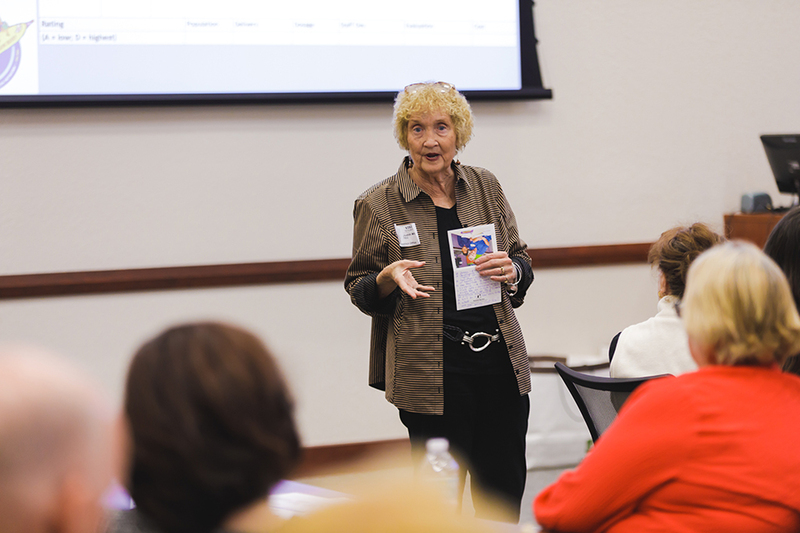 Dr. Fran Adams, retired School District of Indian River County superintendent and “grandmother” to the Moonshot Moment recognized the need for change to curb the tide of growing illiteracy and welcomed The Learning Alliance as a partner. In 2012, Adams acknowledged the county was facing a literacy crisis. She recognized that schools could not bring about change alone and adopted the Moonshot Moment goal to have 90 percent of students reading proficiently by the end of third grade. After retiring, Adams re-doubled her efforts, joining The Learning Alliance Board [the backbone organization of Moonshot Moment] as well as the Board of the Kindergarten Readiness Collaborative, a newly formed 501(c)3 born out of the Moonshot Moment. She facilitates monthly Moonshot Community Action Network meetings and continues to be an inspirational speaker and active community leader, engaging schools and the community in addressing our children’s literacy needs. Judi Miller, CEO of the Big Brothers/Big Sisters of St. Lucie, Indian River & Okeechobee Counties, is an integral part of the MCAN leadership team where she uses Big Brothers/Big Sisters programs as examples to showcase the power of collaboration. Miller's passion for early literacy stems from not having read until she was in the eighth grade and the devastating effects that can have. She implemented effective, school-based-reading mentor programs in Kindergarten through third grade. Former president of AOL, Ray Oglethorpe, current Learning Alliance chairman of the board is one of the principal founders and a significant supporter of the Moonshot Moment. In 2012, he played an integral role in the creation of the BHAG (big hairy aggressive goal) to achieve the county's Moonshot Moment goal. It was Oglethorpe's vision to expand evidence-based programs to the entire school district that launched the county-wide endeavor. His business acumen and passion for creating a literate society have been pivotal in growing the philanthropic base that funds Moonshot Moment programs. An active leader and spokesperson, Oglethorpe credits reading and education as the key factor in determining his success. He grew up in a coal town in western Pennsylvania where most people do not leave or expect to have an international career. Moonshot Reading Rocket’s lead volunteer, Barry Tatem, takes his role to support Moonshot Moment outreach to the “Moon and back” traveling from Florida to Denver, Colo. in 2017 and Philadelphia, Penn. in 2018. The Rocket’s “wingman” volunteers several hours each week and has provided support for more than 300 engagements rendering access to literacy experiences. Fellsmere Police Chief Keith Touchberry recognizes literacy as a path out of poverty and has embraced the Moonshot Moment Movement by transporting the Moonshot Bookmobile; reading in the schools to provide positive role models; presenting the Moonshot message to the community; and through the development of the Moonshot Cadets and Kids program, which partners police academy cadets with third-grade students. In John F. Kennedy's address at Rice University in 1962, he said, “We choose to go to the moon in this decade and do the other things, not because they are easy, but because they are hard.” That's precisely what these Champions have done. At The Learning Alliance, our work is predicated on the question: What does it take to achieve 90 percent literacy by third grade such that we create literate, compassionate, creative citizens who will improve our world? We are a catalyst for innovation and collaboration supporting the Moonshot Moment 90 percent literacy transformative goal by arming front-line educators, parents, and community leaders with the tools, knowledge, and support necessary for success. Through innovative, evidence-based approaches to teaching and learning, we empower teachers to transform children’s lives. Through partnerships with the School District of Indian River County, Indian River State College, community leaders, and civic youth organizations in our community, we hope to create local solutions that can serve as a model for the nation.